We were delighted to take the stage to close the CIM Higher Education Conference in Leeds recently. We shared 20 trends in innovative Higher Education marketing. We focused both on the wider world trends (name-checking Coca Cola and Mercedes on the way) whilst showing how HE institutions across the world were applying similar innovation. We’re on a mission to make Higher Education marketing brilliant so we thought we’d share 5 of the themes (and the slides) here. Last year Coca Cola used 150 of our names on their bottles as they put a bit more fizz into their marketing. And, personalisation continues to be an important, and expected, trend in any brand communications. The developments and accessibility of technology, especially applications, are making campaigns increasingly innovative. The RAF produced a highly targeted and personalised email campaign to attract applicants. When people registered an interest to join the RAF, key data was collected, including the email address and post-code. This meant that the post code could then be used to collect an aerial image (via Google Maps / Earth) and manipulated to look like a targeted view from above. 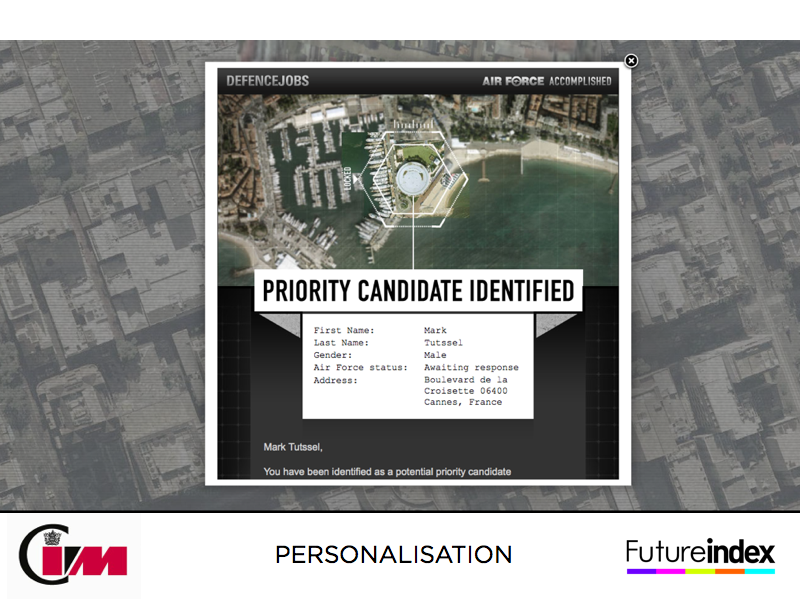 This was then embedded into the email that was sent out with the message ‘Priority Candidate Identified’. Highly creative and to the point! 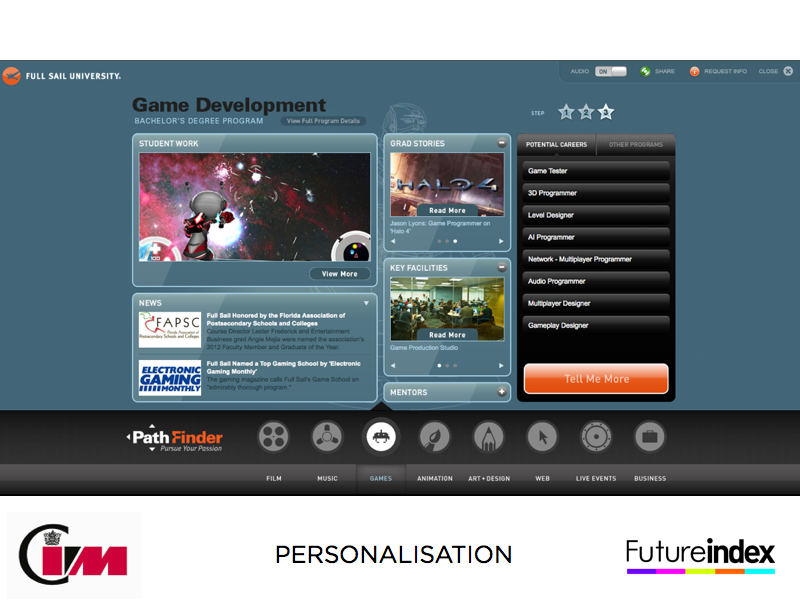 Meanwhile, the in-site Pathfinder app from Full Sail University stands out as one of the best personalised student applicant experiences out there. There is no need to sign-up, no difficult navigation, just a few clicks and you get your own beautifully designed web page – tailored to the specific course you are looking for. Whilst the design would take some work the basis of it all is relatively simple, and achievable, as it is built on pulling in feeds from content libraries, social media and from the outside world via RSS. Crucially, it takes just a few seconds to enjoy and you’re never asked for any personal information. Definitely a useful alternative (and complement) to the more formal CRM process. 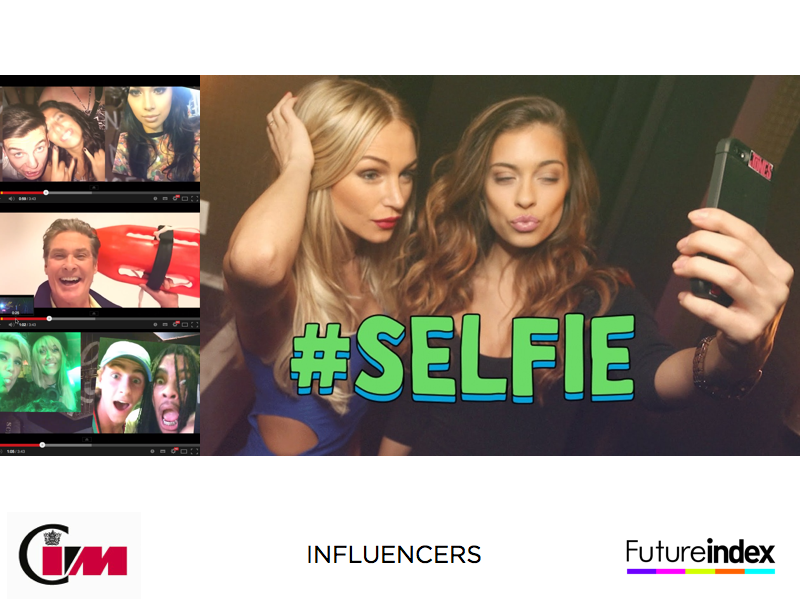 Musically the hugely successful #SELFIE tune from the Chainsmokers doesn’t really do it for us. You can hear it if you want here and read up on its appeal to an Instagram generation. However, in marketing communications terms it impresses! The key to its success has been to take uploaded #selfies from influential Facebookers, Tweeters and Instagramers and use them to make a core part of the video. If you’re suddenly in a video like this you are likely to share it. And that’s how the song ‘seeded’ its success. Using influencers to share content is a major trend right now. Another great example is how Mercedes lent new cars to the world’s most popular Instagram photographers and asked them to share the photos of a road-trip, reaching a potential audience of millions. Have a read-up on the campaign here. The use of social media influencers is a key trend for HE institutions to consider. Many have already immersed themselves in the world of student ambassadors and curators. But this example raises the bar of possibility. 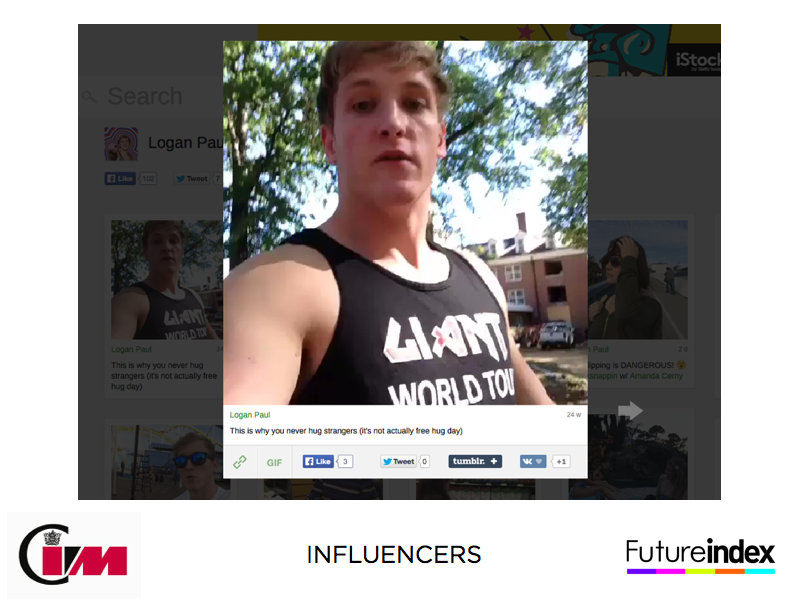 In just 6 seconds, one of the most popular Vine generators, Paul Logan, proved how he could get a campus video in front of over 1 million followers. His ‘supervine’ from his home Ohio University campus is pretty basic, and completely frivolous, but is a window into how even better content could be shared by influential students amongst their peers. HE marketers take note. It’s fairly common knowledge now that banner and button advertising is on its way out. After all, just how many people click on a banner these days? Some marketers are overcoming this by telling the story on the banner itself, often with the use of images and video, but many are jumping into the buzz world of ‘native advertising’. It’s essentially a product placement tactic. The idea is simple – create engaging, valuable content that fits with the editorial remit, and the reason an audience is there. This manifests itself in a range of Facebook and Instagram stories, Snapchats and Buzzfeed posts. Watch out for the possibilities with Twitter now too. Imagine linking your own database of email addresses with Twitter’s and then sending promoted tweets to appear at the top of your target audience’s feeds. Read up on what’s happening here. 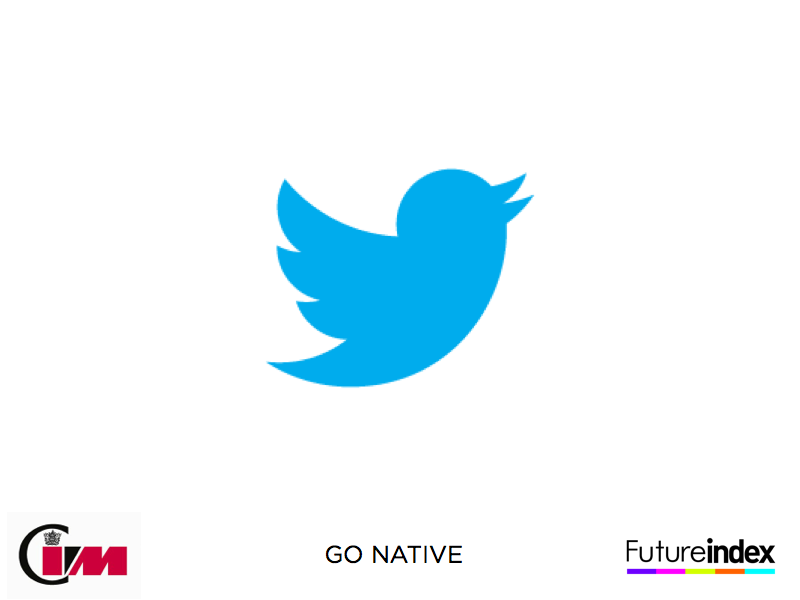 Marketers that want to engage with ‘Customer 3.0’ are now exploring ‘native advertising’. It’s a type of product placement that allows the advertiser to join in on the main action, rather than stick a message on the periphery . To ‘join in’ requires valuable, useful content that fits with the main event. University marketers are recognising the importance of being in the right place. 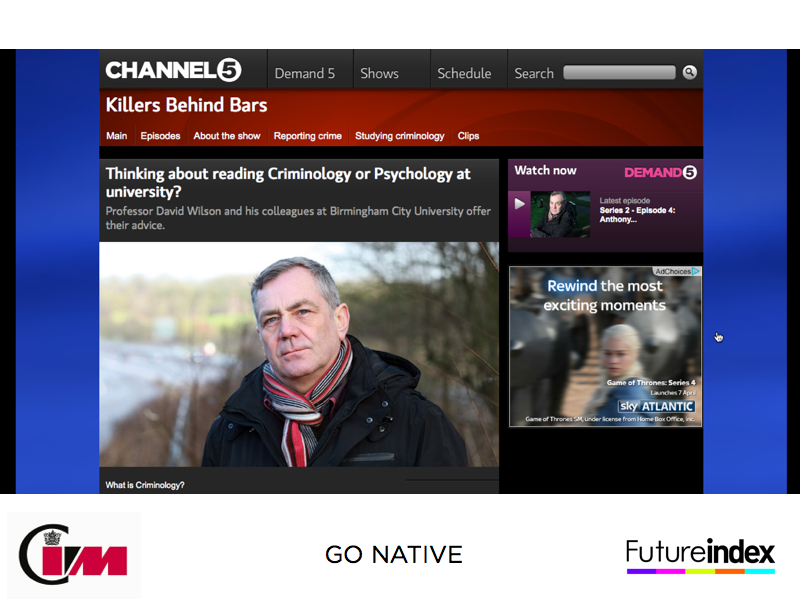 Look at this example of how Birmingham City University offer more information on Criminology right in the middle of a Channel 5 crime programme schedule. 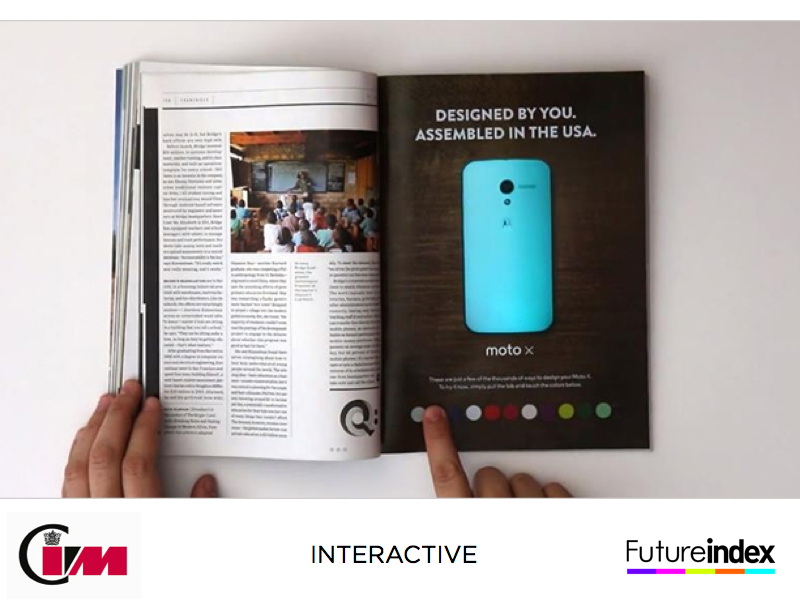 Motorola’s campaign for its Moto X phone made the news for its innovative approach. By inserting a thin layer of electronics into its full page advert in Wired magazine in over 150,000 copies in the USA. If the reader pressed one of the printed buttons then the phone would change colour! Pretty clever for a print ad. You can read Adweek’s take on the story here. This campaign helped to reinforce the key feature of the phone – that you could choose it in different colours. If you like this kind of innovation then click on this example – how Forbes managed to insert a wifi hotspot into its magazine, enabling readers to pair their phones up and watch video. 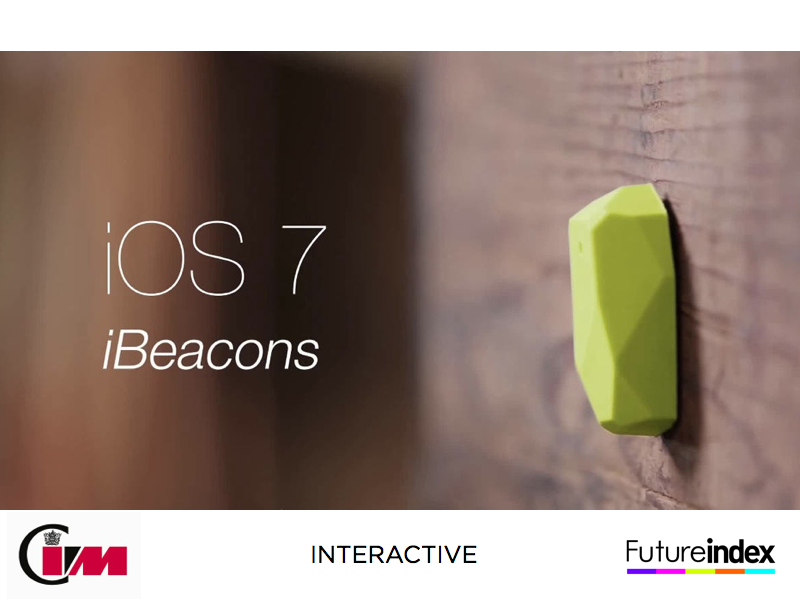 Apple’s iBeacons are worth reading up on. Marketing Magazine offers a useful insight (if you’ve not already blown your 3 free previews! If you have, just google it!). As the name suggests, these beacons are from the world of sensors, tracking and interaction. They can be used to talk to you as you pass them. The University of South Wales recently announced via the Guardian how they were launching a new Unibox app with over 270 content items (including student work, application tips and short video insight into the teaching) that would also integrate with a student’s real life tour of an Open Day. It’s definitely a window (or OS) into the future. 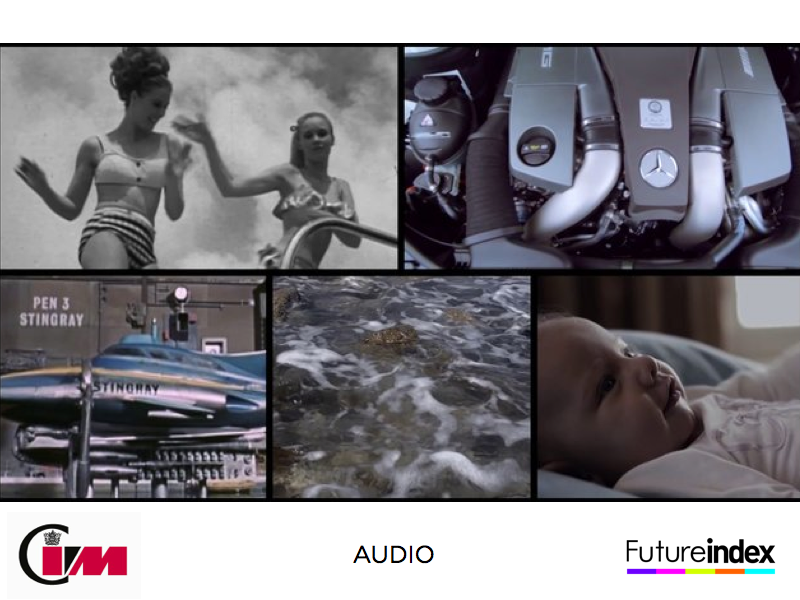 The recent Mercedes campaign has used audio as the real driving force. The supporting website allows you to mash-up your own sounds with samples of everything from Tinie Tempah to the sound of the E63 AMG engine. Innovations in technology are enabling sound to play a bigger role in brand building and we are already seeing numerous universities take a foothold in the Soundcloud platform. Soundcloud offers some advice on how you can use it to customise all sorts of interesting marketing communications. And of course there is the innovative use of Shazam. The Shazam app recognises music playing and can then pull in details of the song and even the chance to buy it. However, Shazam can be used to recognise any sound and is being used more in retail outlets to link to voucher offers and in TV advertising to enable the audience to download further content onto their smartphones. Soundcloud is trending right now in HE. Universities, particularly in the USA, are starting to use it on a daily basis. 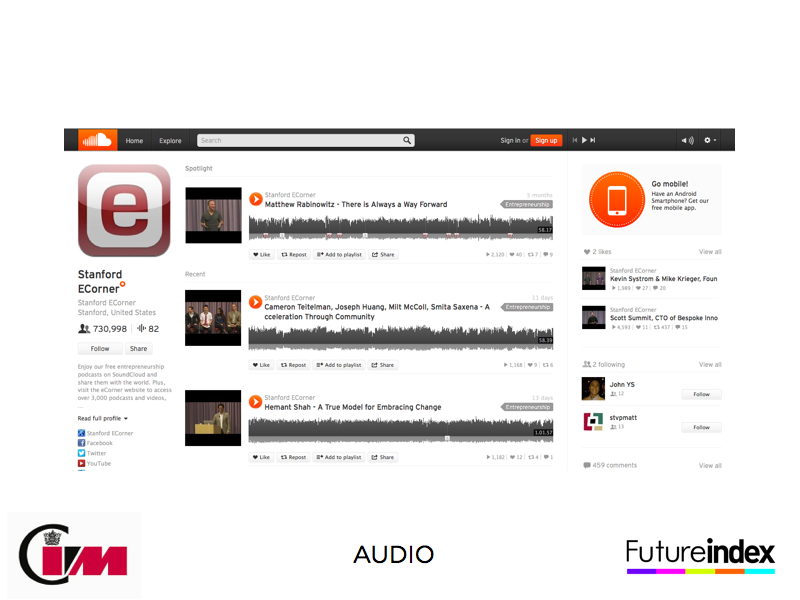 Soundcloud is easy to use both via the web or app – to upload live sounds or files, to annotate and add narrative and photos to the story too. It’s equally easy to access either directly or via social media links (Twitter and Facebook work very well with it). Arguably a cooler alternative to iTunes, it’s worth stressing that Soundcloud is often used by students for their own personal use (including uploading music, live bands, DJ sets etc) and therefore should be a key consideration for any marketer looking to engage with students. King’s College use Soundcloud really well to link opinion to big news stories, but also check out Stanford and its library of sound. That’s just 5 trends in innovation that Higher Education Marketers should be making note of. To find out much more about The Future Index, the HE marketing inspiration we are collecting and how it could be of use to you, please have a look at our main site, complete with lots more samples for you to take away and use. Simply click here. We are currently taking the full 20 Innovation Trends on the road, and about to re-open our Future Index Academy. So, do contact us if you want to be involved. Future Index has been a really useful resource for engaging the team, for sparking new ideas and for stimulating debate – and for more than a few actual new projects! Our reports and workshops are a great way to stay up to date and at the top of your game. We’ve particularly found the tailoring useful as we can focus on specific landscapes or sectors – research, for example – in an easy to use and digestible way.